This CD set garnered some complaints almost as soon as it saw the light of day, with Colin Mackie on the message board of this site lamenting the fact that we were being given further recordings of the First and Fourth Symphonies while others of the Butterworth canon languished unrecorded. Well, although the First and Fourth were included in a previously issued Dutton collection (and the First had also previously appeared on a Classico CD) both of those earlier releases appear to have succumbed to the deletions axe, or at least are not listed as currently available on Arkivmusic. No doubt second-hand and remaindered copies may be obtained on the internet, but at the time of writing Amazon yielded only copies of the Dutton set at £15.62 and the single Classico disc at £16.50. This makes the newly released set a considerable bargain by comparison. Unfortunately the recording of the First Symphony held in the BBC archives was wiped, and Richard Itter’s home taping required considerable work to obtain any sort of satisfactory results - Adrian Farmer explained this in an appended remark to the earlier review on this site by Stephen Greenbank. The sound on Barbirolli’s pioneering broadcast featured on the Dutton set is similarly of poor quality, which leaves only the deleted Classico recording conducted by Douglas Bostock to provide us with a recording in modern sound (and it is coupled most enterprisingly by the Second Symphony by Ruth Gipps). The quality of the sound here is doubly unfortunate since this was the work which established the composer’s reputation (and it remained his favourite among his output), and to hear it conducted by the composer himself is especially valuable. Recordings by composers are a somewhat fraught issue; although, in my experience, orchestras are both understanding and tolerant of the technical shortcomings of composers wielding the baton in their own scores, there is nevertheless some degree of inevitable hesitancy when a potentially fallible figure is on the podium. Such considerations do not apply in the case of Butterworth, who was an established conductor in his own right; and he should therefore be believed when in the First Symphony he takes each and every movement more slowly than Barbirolli, in the case of the slow movement extending the duration by more than two minutes. Similarly, in the Fourth Symphony Butterworth on Dutton is slower than Bryden Thomson here in all movements except the first; and he adds more than three minutes to Thomson’s timing in the finale. The results in every case are sheer gain; this is music which gains in power and stature from the composer’s own more deliberate approach, whatever may be the sacrifice in excitement as the music builds to a climax. The music of all these symphonies is indeed powerful and exciting. The atmosphere of the landscapes of northern Britain (Scotland as well as Butterworth’s native Yorkshire) dominates the music as surely as that of Finland dominates that of Sibelius. Comparisons with Sibelius do not end there, as the structure of the symphonies is equally assured as in the case of the Finnish master. Parallels with Nielsen and Bax are also apposite. Those who would like to experience something of the ongoing tradition of classical music in Europe deriving from that prestigious line will find something gripping and absorbing here. The recordings of the Fourth and the Second Symphonies are considerably better than that of the First, and indeed give credit to the BBC engineers who supervised the broadcasts; one can only regret that Lyrita did not see fit to include the Third Symphony, similarly recorded by Bryden Thomson for broadcast, which would have added an otherwise unrepresented work to the catalogues (but which has been available at times on the internet). There would indeed have been room for this on the second CD, and if Richard Itter himself had not recorded the broadcast presumably permission to license the BBC tapes could have been sought. 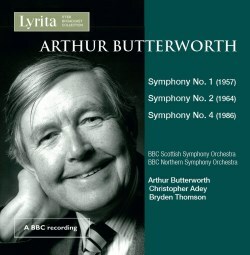 I should add that there was at one time a Dutton issue of Butterworth’s Fifth Symphony conducted by the composer, but this too appears no longer on current listings although Amazon offer one solitary copy at the swingeing price of £14.82. This unfortunately appears to be par for the course with Dutton. We are of course immeasurably grateful for the label’s extensive explorations of the neglected repertory, not only of British but of international music too, many of them in superb performances and recordings; but the company does seem to be content to allow these issues to go out of circulation once the initial pressings have been sold, which robs subsequent potential purchasers of the chance to explore the music. Some of the recordings do maintain a presence on Spotify, but by no means all; nor are many of the releases available as downloads. Is there something that can be done to keep these valuable recordings in circulation (and hopefully generating income for both the company and the artists involved, as well)? But enough of carping. This is a valuable issue which provides the listener with readily available performances of three major symphonies, and I find it amazing that at the time of writing I could find no evidence that (outside this site) it had garnered any critical attention from reviewers beyond a tangential reference to the release in a Guardian article devoted to the del Mar recording of Bantock’s Omar Khayyám. (The Lyrita site itself does feature an anonymous review which for some reason credits the performance of the Fourth to Vernon Handley.) This is a real injustice to music which should be looking to attract substantial interest from the general music-lover. And then again, if other reviewers eventually prove to be equally enthusiastic, we might possibly hope for releases of the other symphonies which Butterworth wrote after the Fifth.